Drain the beans except pork and beans. Fry bacon and onion until onion is tender, about 15 minutes. Stir in rest of ingredients except beans. Simmer, uncovered, for 15 minutes. In a 4 quart casserole combine all beans and toss lightly to mix. Spoon bacon mixture over beans and bake uncovered in 350° F. oven for 50 to 60 minutes or until bubbly. All the favorites of the Belle Center Amish Community. Over 600 of today’s family favorites, and even some from Grandma’s kitchen. All the usual sections are here. 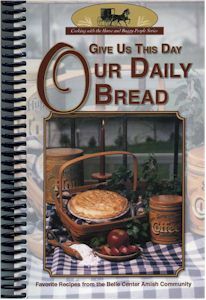 But what makes Give Us This Day Our Daily Bread special is the appetizers, large quantity recipes (for weddings, reunions, and other special occasions) and the children’s recipe section. The tips, hints, and quotes section is filled with everyday kitchen secrets. Laminated cover – Spiral bound – 263 pages. To order this book, please visit our friends at http://www.Amishshop.com Richard from Amish Stories.